Generally when we hear the word Tower, Our thoughts brings some long standing vertical like structure, One like Rajabai Tower, which we generally refer and think of. But, here the Parsi tower of silence is a restricted hilly location of south Mumbai’s Malabar hill area which is a 55 acre wide spread surrounded by thick green trees and visibility is not their from surrounding. Their are 3 rings (Huge Circular Structure like Water Well) also called ‘Dakhma’, used for body disposing of the dead Parsi people. All 3 Bawdi are separately built for ‘Males’, ‘Females’ and ‘Children’. 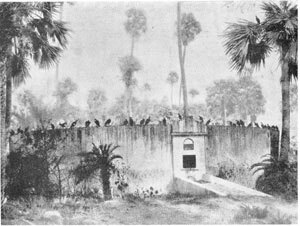 After all rituals and other process that is followed as per Zoroastrian community is done, the dead body is brought to this Dakhma inside tower of silence which is finally consumed by Eagles and Vultures. This is one of the very different type of cremation process followed by community originating from Iran in 9th Century AD. According to the religious belief the idea of creating such Towers around world and serving the body to Vultures and Eagles is the best Eco-friendly way of disposing the body and will not harm mother nature in any ways. According to them the death body should not spoil the environmental air, water or soil by cremating it in this way. Recently, the effect of globalization and urbanization in Mumbai city was seen with decline in numbers of such Eagles and Vultures seen around Parsi Kua (Bawdi). Those creatures plays a vital role at tower of silence disposing process. To keep up the numbers, Community people in Mumbai joint hands with BNHS CEC who helps eagles and vulture breeding at our borivali national park. As said, you will not be able to get inside the 55 acres area, yet here is how one can reach this decades old historic location. Nearest station to reach is Grant Road and Charni Road at Western Railway Route in South Mumbai. Long distance trains which arrives at CST will also do. Simply take a Cab / Taxi and ask for ‘Malabar Hill’ or ‘Kemps Corner’ and its 10 to 15 minutes distance from those 2 stations. The below Google map aerial view shows the 55 acres of green belt of Tower of Silence with 3 Rings (Try Zoom in to See Exactly). Surrounded by B G Kher Road, Ridge Road and Dungar Wadi Road.